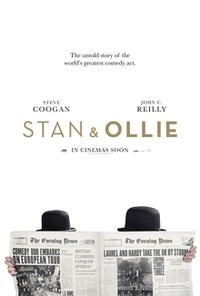 Stan & Ollie is an upcoming biographical film directed by Jon S. Baird from a screenplay by Jeff Pope. Based on the lives of the comedy double act Laurel and Hardy, the film stars Steve Coogan and John C. Reilly as Stan Laurel and Oliver Hardy. This webpage uses material from the Wikipedia article "Stan_%26_Ollie" and is licensed under the GNU Free Documentation License. Reality TV World is not responsible for any errors or omissions the Wikipedia article may contain.